Here in northeast Ohio, some things never change. The Browns are bad. Arctic winds will soon blow in from the banks of Lake Erie. And LeBron James might leave. As much joy as James has supplied the formerly championship-starved residents of this region, he has developed a semiregular pattern of keeping them in suspense: Will he stay or will he go? With his contract (again) set to expire at the end of the season, his plans are (again) uncertain. Fans hope for the best but brace for the worst. The “Stay Home 23” shirt at All Star Sports Gifts near Akron. “It’s like you have a shiny new toy, and you feel guilty for playing with it because you think someone’s going to take it away again,” said Jason Herron, a 44-year-old season-ticket holder. Herron, the general manager of a car dealership, is a fan of some repute. In 2010, when James announced that he would sign with the Miami Heat after spending the first seven seasons of his career with the Cavaliers, Herron was filmed by a local television news crew igniting a bonfire outside a bar. He used a James jersey as kindling. James, of course, returned to Cleveland in 2014 and delivered a championship in 2016. If he were to leave again, Herron said, there would be no hard feelings. James, who grew up in nearby Akron, came home to win a title, and he made good on that pledge. But people are still anxious. The LeBron agita is real. It is persistent. It is not going anywhere anytime soon. On Sunday night, Herron attended an event for season-ticket holders at Playhouse Square, a performing arts center in Cleveland. James was joined on stage by his teammates. Fans here are susceptible to a range of emotions that James is uniquely capable of stirring, all at the once: pride and pleasure, pain and panic. Last month, he seemed to offer some assurance about his future when he reiterated to reporters that he intended to close out his career in Cleveland. But then he left the door ajar. Until then, the LeBron loyalists will wait and watch, although a few are already trying to influence his next decision — with T-shirts. 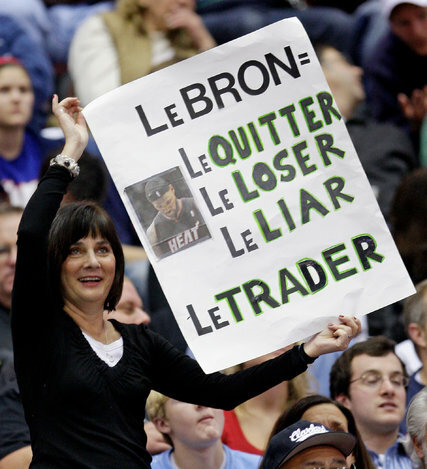 A Cavaliers fan at LeBron James’s first game in Cleveland after he left the Cavaliers to join the Miami Heat in 2010. Consider Miller, 35, and Clark, 38, childhood friends from Akron who opened their apparel company, 7th Floor Clothing, during the Cavaliers’ championship run in 2016. Miller, who works as a tax professional, had been making T-shirts on the side for years. He was mulling the idea of turning the hobby into a business. Clark, who has a background in graphic design, was all for it. Before Game 7 of the finals, they saw an opportunity. With the Cavaliers’ series against the Golden State Warriors still to be decided, Miller and Clark pre-emptively printed 100 T-shirts that read “2016 World Champs” across the front, aiming to charge $20 apiece for them. It was a bold move. They put two of them on and loaded the rest into a pair of duffel bags, then headed to a watch party at Akron’s St. Vincent-St. Mary High School, James’s alma mater. The Cavaliers won, and business boomed. “We sold out,” Miller said. 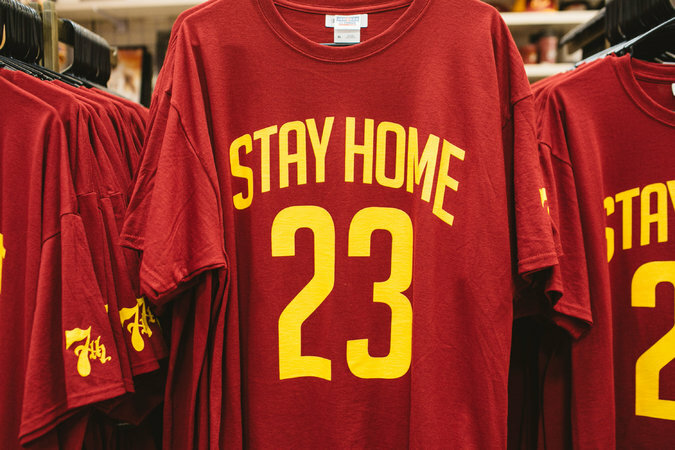 Their latest line of merchandise, called “Stay Home 23,” captures the LeBron-fueled angst that is slightly clouding the start of the season, and all the pleading that goes along with it. James wears No. 23. The slogan is not nuanced. Nuance is not the point. “It’s really just for fans to have something that sends a message to him: We want you to stay,” Clark said. They have been selling “Stay Home 23” T-shirts and baseball caps online and at All Star Sports Gifts, a shop here at Summit Mall in Fairlawn, about 30 miles south of Cleveland, where oversize posters of Miller and Clark wearing “Stay Home 23” gear hang in the windows. They collaborated on the campaign with Tom Brode, 40, the owner of the store and a longtime season-ticket holder. Chris Brode, 22, who manages his father’s store, noted how James’s impact extended beyond basketball. He has committed millions to education. Many suspect that his mere presence has helped boost the economy. And there is basketball, too: The Cavaliers were a hazmat spill when he was in Miami. “Everything’s just better when he’s here,” Brode said. On Tuesday night, ahead of the Cavaliers’ season opener against the Celtics, Miller and Clark were planning to load up their duffel bags once more and set up shop across the street from Quicken Loans Arena. They had T-shirts to sell and a message to spread. They just needed one particular person inside the building to listen.